Ready to Savour the Acai Bowls of Your Dreams? Acai bowls, also known as smoothie bowls, are sipping into the menus of every cafe and restaurants around town. If you’re a foodie who is picking up the habit of healthy eating, this is definitely good news for you. Topped with fresh fruits and superfood, here’s where you should hang out for a bowl of acai. Getting into the groove of healthy eating is easy when you’re at Rubberduck. Aside from the sandwich lunch specials and breakfast omelettes, check out their smoothie bowls! Give Sunshine Bowl (banana, mango, granola, and chia seeds) or Berry Smoothie Bowl (fresh fruit, homemade granola, Hawaiian coconut flakes, and organic flax seeds) a try. 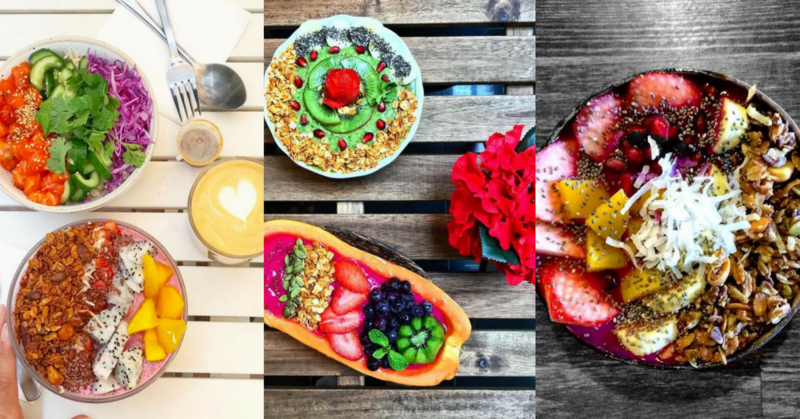 While La Juiceria is largely known for their range of refreshing juices and awesome superfoods, their smoothie bowls are pretty stellar itself. Enjoy a spoonful of Pittaya Bowl (red dragon fruit, bananas, premium granola, chia seeds, and strawberries) or Acai Berry Bowl (acai berries, bananas, maple syrup, strawberries, and chia seeds). Yes, Pickle & Fig’s gourmet sandwiches and savoury brunches are tough to resist. If you’re interested in trying something new from these guys, how about their smoothie bowl for a change? Topped with toasted muesli and fresh fruits, every smoothie bowl comes with a range of fruit selections, such as dragon fruits, honeydew, or papaya, to brighten it up. Kick start the habit of healthy eating by hanging out at Ola Bowls. With superfood, fresh fruits, and healthy ingredients combined, you will get a wonderful selection of smoothie bowls. Go for the King of Greens (avocado, bananas, goji berries, almonds, cranberries, bananas and coconut flakes), or Scooper Dooper (berries, acai powder, granola, strawberries, bananas, coconut flakes, chia, and pumpkin seeds) for something refreshingly healthy. With a strong emphasis on using authentic acai pulps, Cabana has definitely got us crazy for some acai bowls. Treat yourself with their signature Rio Classic (apples, bananas, granola, and dark chocolate) or Tropical Thunder (pineapple, bananas, kiwi, strawberries, mango, granola, and coconut) for some healthy boost. Living in Subang Jaya, Cheng Sim pens about travel, lifestyle, and any topics under the sun. Before chasing any deadlines, this Malaysian wordsmith counts on caffeine-free tea and Spotify to fuel her writing inspirations.